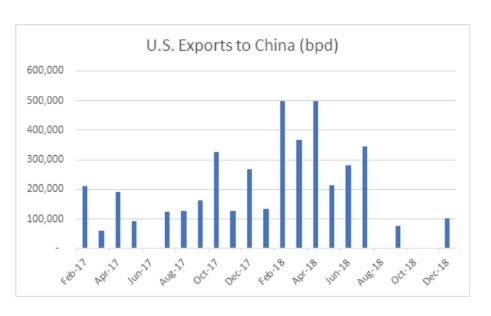 The U.S. sent the equivalent of 500,000 barrels per day to China in 20 shipments during the months of February, March and April, according to data from Genscape, the world's largest vessel monitoring company. There was only one shipment from the U.S. to China last fall before the two that left in December. Those final two held an average shipment equivalent to 100,000 barrels a day, about one-fifth the size of the spring peak. "So while the oil deliveries are promising, the fact no subsequent ships are set to arrive after the tariff deadline shows you the pace of the trade discussions," said Hillary Stevenson, director of oil markets and business development at Genscape. "We just have to wait and see. China is buying U.S. crude again but not at its old pace."